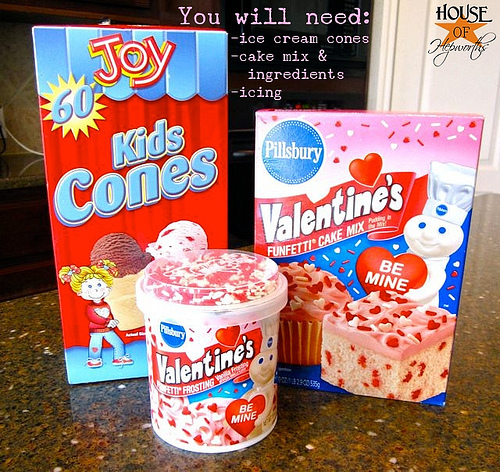 Valentines Day Cupcake Cones for Kids! We know….cupcakes + kids = messy. Crumbs. Leftover cupcake wrappers. 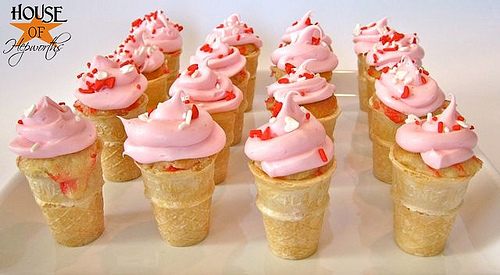 How about baking cupcakes in ice cream cones instead? No wrappers to throw away and it will seem like eating ice cream cones for the kids. A win-win! This recipe from House of Hepworths uses the kid size ice cream cones for a smaller sized, kid friendly cupcake. The recipe calls for a box mix cake and canned frosting but the idea and instructions could be modified to use your favorite cupcake recipe and frosting. Let the kids to do the decorating! Ice Cream Cones, Box Cake Mix, & a container of Frosting. Mix the cake mix according to the instructions on the back of the box. The easiest way to fill the cones is by putting the batter in a gallon size ziploc bag, snipping the corner, and squeezing the batter into each cone. Head on over to House of Hepworths for the full instructions and rest of the tips on this nifty idea! Hi Pam! I’m excited that you like my cupcake cones and wanted to share them with your readers.